When I first learned how to play music I learned how to play the drums, and thus rhythm was the first thing I knew about music. I still feel like it was best to learn rhythm before pitch, melody, harmony, etc. and even today complex rhythms are something I look for and strive to achieve in my own music. I never joined drumline though, and never got much into practicing rudiments and that's something I want to improve on, so I come asking a question about subdivision. Here I have layed out a chart that shows all the most basic rhythms I could think of in terms of a single beat, dividing the beat from one to twelve equal parts and doubling the all note values twice to give me three charts based on differing note values. I also included a list of the first twelve and the method I use to count the basic rhythms. My question is multifaceted: how do I count the rhythms I have unmarked, especially 32nd notes and quintuplets? Am I missing any special tuplets? Is there a good way to go about practicing them? Is there a difference between say, a sextuplet and two triplets, or a ten-tuplet versus two quintuplets? Mostly I'm wanting to know a good way to subdivide and count odd tuplets such as these so I can better incorporate them into my playing/composing. Am I missing any special tuplets? Is there a difference between say, a sextuplet and two triplets, or a ten-tuplet versus two quintuplets? You see that the natural way to play this is with 3 accents (1st, 5th and 9th note). So you will need to put the accents wherever your musical feeling tells you :---). I guess that in theory, the 10-tuplets would work in a similar way (2 quintuplets = 2 accents, 1 10-tuplet, maybe 5 accents or maybe 1? ), but these large tuplets are probably seldom meant seriously: see this question of mine: How are very long tuplets in Romantic music played in practice? Is there a good way to go about practicing them? I don't try to count them. I obtained a "feel" for most of the "normal" rhythms (that "feel" makes it possible to play them effortlessly). I think it's possible to get this "feel" for these tuplets as well. But maybe counting works well for you (and then, sadly, I'm not able to help with that) and the next points will be of somewhat lower use to you. If the tuplet is not prime-numbered, then break it down into smaller ones, i. e. 9-tuplet to 3× triplet (9 = 3×3). Another good thing for dispensing with these tuplets is to break them into series of 2 and 3 notes. For instance: quintuplet = 2 + 3, heptuplet = 3 + 2 + 2. When performing them, you can just put the accents there to make the subgroups stand out. 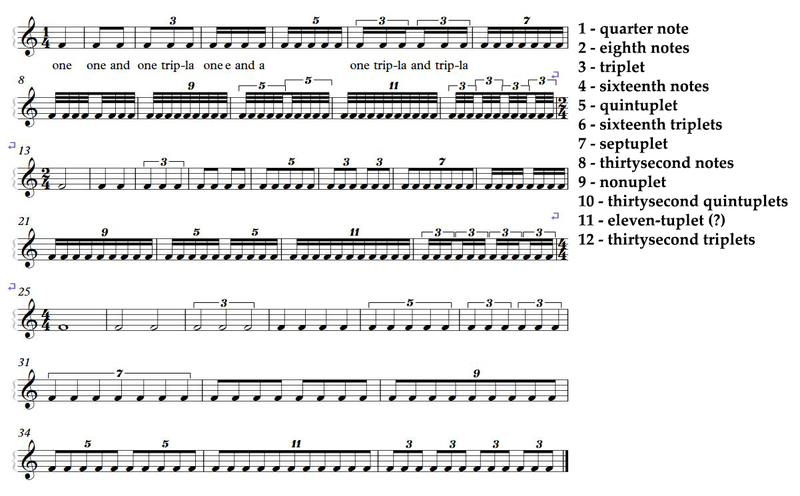 This helps against getting "pulled" into a more regular rhythm (otherwise, when you will be trying out quintuplets and heptuplets, you will most likely end up seeing yourself doing sextuplets). Generally, what helps immensely is just picking an instrument and improvising in 5/4, 7/4 and so on, because what the tuplet does is that it effectively "switches on" this rhythm for a while. If you make yourself comfortable with them, you won't have any problems with the tuplets too. (The accents are just to make it easier to practice, they should be got rid of eventually.) I would tap a long row of quintuplets, as in the first bar. I would repeat it quite a few times. When I feel comfortable with that, I would substitute one quintuplet with something "normal" (examples in the next bars --- it can be a quarter note, two eighths, a triplet... whatever), following immediately with one quintuplet, and so on. Anyway, this sounds like I was an expert on insidious tuplets, but to be honest, I fail at doing them properly quite often. What I described is just what I find to be helpful. The good part of this is that you can practice everywhere: in a queue, in the public transport, etc. You can tap the rhythms silently with a finger against the other palm, or don't do anything and just imagine the rhythms, maybe nodding your head on every beat. Not the answer you're looking for? Browse other questions tagged theory technique sheet-music rhythm polyrhythm or ask your own question. How can I count 17 against 3 polyrhythm?